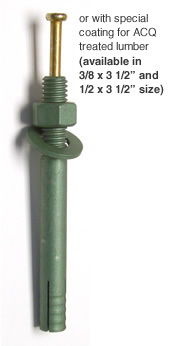 The All American Anchor is a positive drive – positive setting anchor for use in all masonry materials. to the bottom for stud-type applications. overhead installations, etc.) may require a safety factor of as much as 10:1, or more. With nut, washer, and set-pin in place, insert anchor into hole. No need to torque nut to set anchor. Where do I use All American Anchors? 14560ST 1 1/4" to 5/16"
38120ST 1 3/8" to 1/2"
58340ST 1 5/8" to 3/4"
The All American Anchor Setting Tools were designed for setting anchors in areas where a solid blow to the anchor pin is not possible, (such as deep electrical boxes). This hardened steel tool is zinc and yellow dichromate plated. For setting pin drive anchors in areas where a solid blow to the pin head is not possible. Meets plating standards in compliance with A.S.T.M. b-633.